Ignite's design objective was to transform this struggling centre into a contemporary shopping environment which would optimise its potential customer base and service the local community. Housed in group of heritage buildings on Sydney's waterfront, the Birkenhead Point factory outlet centre had become run-down over time, but still boasted a prime location. 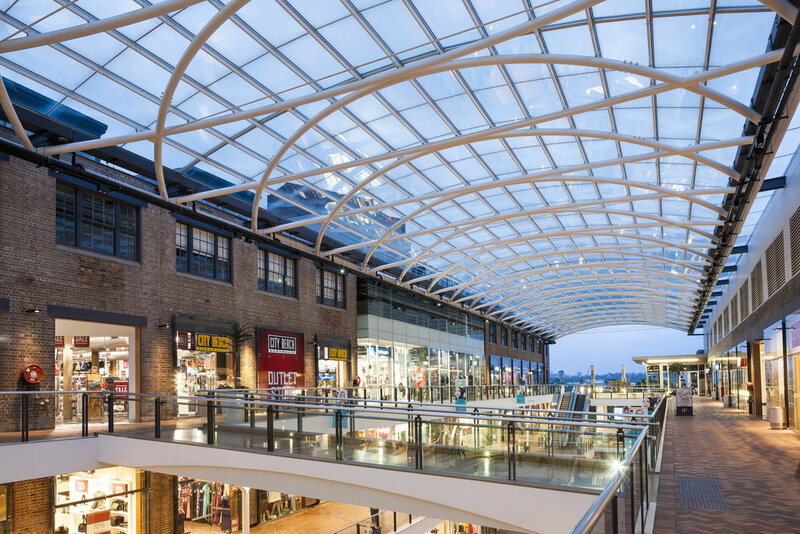 Its redevelopment focused on the internal environment and workability of the centre by improving the connectivity of the existing retail space, generating new area, and creating an attractive and memorable shopping destination. When Ignite was asked to advise on development options for the Birkenhead Point Outlet Centre, it had been in use as a retail centre for many years, but was struggling. It was tired and run down, difficult and confusing to navigate, with many of the shops empty. In addition, the buildings were designated as Heritage items. The primary challenge for Ignite was the resurrection and re-invention of this dying retail centre. The opportunity was clear: over six levels, Birkenhead Point had the potential to become a landmark retail centre, a real people-oriented destination in a unique location right on Sydney Harbour. The main issues Ignite faced were; how to improve the poor connectivity between buildings, add leasable space within the constraints of the Heritage buildings, and provide weather protection in the main central space while maintaining the ambience of an open air centre. Ignite designed a solution which added only 5,000sqm of additional building and area to the site, while unlocking the large areas of unused spaces within the existing buildings for retail use, to result in a centre of some 35,000sqm. Space generating little or no income was transformed into valuable leasable area and significantly increased investment returns. Connectivity and customer flow was greatly improved, with amalgamation of previously separated spaces within the buildings. A grand central space was created, open to the harbour but protected with a 2,000sqm glazed roof, and this has become the defining image of the new centre. The heritage aspects are celebrated and enhanced by the new – brick arches are viewed as exhibits behind four metre high glass shopfronts. The infill elements are of modern, slick glass and steel. All of this is set against the older, softer, more aged finishes of the original red brick buildings. The result is a dramatically revitalised centre in both operation and appearance. The centre’s heritage buildings and facades have been retained but, where refurbishment and new work has been done the design uses a new language, clearly juxtaposing contemporary materials and finishes against the predominantly brick buildings of the existing centre. In this way a new contemporary presentation is achieved by taking the existing building fabric as its visual context, but no longer being dominated by it.